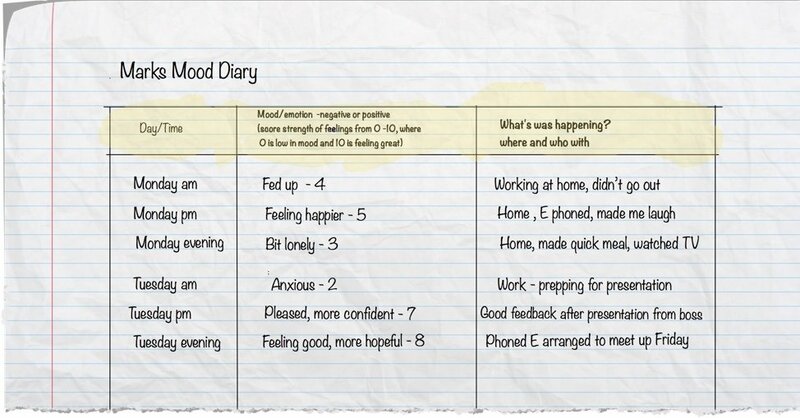 A mood diary helps you monitor and track your feelings. Quite soon you’ll be able to spot patterns because you’re scoring how you feel and linking it to what you do. You’ll become aware of what makes you feel happier and what doesn’t. For instance when your scores indicate a downturn in mood you can take action by doing more of what the diary informs you makes you feel better. It’s an effective tool for helping you help yourself. After a while Mark might see a pattern that when he doesn’t go out all day, say just to the gym or to work online in a coffee shop, he feels worse. And when he talks to people face to face or by phone or Skype he feels better. He begins to recognise that even if people say they can’t talk or meet up it might be because they’re busy and it’s not about him. That used to be an unhelpful assumption he often made. You can even use a mood diary with your talking therapist to help you lift your mood. You can use the template below to get you started.